A strange band of cultists is stirring up trouble. Update: The 2.4.3 patch is now live in the Americas region, with full patch notes up at Battle.net. The update will presumably be rolled out to Europe and Asia in short order; Blizzard said players in those regions will be prompted to download it once it becomes available. As of the 31st of December, the original Diablo is now 20 years old. That's a venerable enough age to qualify for a cross-game celebration, and developer Blizzard is doing just that with a series of events across its current stable of games. 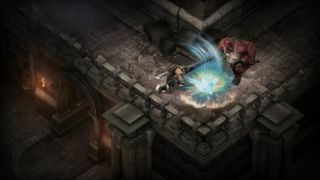 Diablo 3's big event is the time-limited The Darkening of Tristram, which recreates the 16-floor cathedral-dungeon from Diablo 1, while adding a pixellated visual filter, removing the run button, adding a more restrictive camera like in the olden days, and having more rigid animations and tinnier sounds. What a strange idea—essentially remaking an old game in a shiny new engine, but making it look and feel as dated as possible—however, as long as the guitar-tastic Tristram music is in there in some form, all will be well, I'm sure. Patch 2.4.3 will make a few other changes too, as detailed on the ever-useful Battle.net blog. Updated items, tweaks to the way Greater Rifts work, and quality of life changes including the ability to slay leaping enemies in mid-air. While you'll die in the usual places—at the feet of a big horde of enemies, most likely—you'll soon dye at a new vendor, Miriam. The mystic will be handling your laundry from patch 2.4.3 onwards, and I'm sure she's just thrilled about that. There's no date for the update yet, but Blizzard reckons it's "right around the corner". You'll be able to play The Darkening of Tristram during January only, but if you miss it, it might return as an annual event.